Patio 805 wins for vegetarian stir-fries, bowls, curries and hot pots. 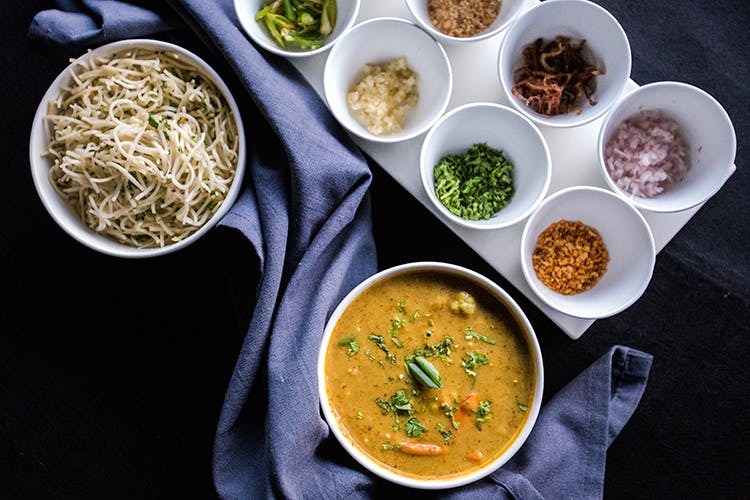 Plus, a smattering of Vietnamese specials including the famous filter coffee makes this vegetarian restaurant in Jayanagar worth going to. Located right next to Starbucks on 4th Block, Patio 805 is airy, full of greenery and an illusion of space is created because of big glass windows. Started off with a Vietnamese filter coffee served with condensed milk and ice cubes. The coffee here is brought from Vietnam; much like Hanoi, there are options of Thai iced tea, coconut coffee and siphon coffee too. The Vietnamese coffee here is pretty authentic and they also have a page full of mocktails if you are interested. For starters, try the Crispy Wok Tossed Mushroom and Vietnamese Rice Rolls. The rolls are stuffed with rice, cucumber, beans and other veggies and served with a piquant dipping sauce. For mains, we recommend the Vietnamese Asian Noodle bowl — deep-fried crunchy noodles topped with a Vietnamese-style soya based sauce and lots of vegetables. It's a hearty bowl, which thankfully wasn’t sweet and the portions were generous and can be shared between two easily. Save space for the Vietnamese curry, a lovely fragrant broth flavoured with Vietnamese curry powder (brought from Vietnam apparently), lemongrass and coconut milk. You will love how well the curry goes sticky, fragrant coconut rice that's tossed with butter and veggies. End your meal here with Patio 805’s Fig and Red wine ice cream, made in house. We caught bits of fig in the ice cream and the hint of red wine was unmistakeable too. We also tried the chocolate chilli flavour but missed the hint of heat in it. If you are going in a bigger group, try their hot pot, especially the kimchi one.